The 87740 motor is the driving force behind some of the most popular pipe threaders in the industry, including the RIDGID 300 and 535. 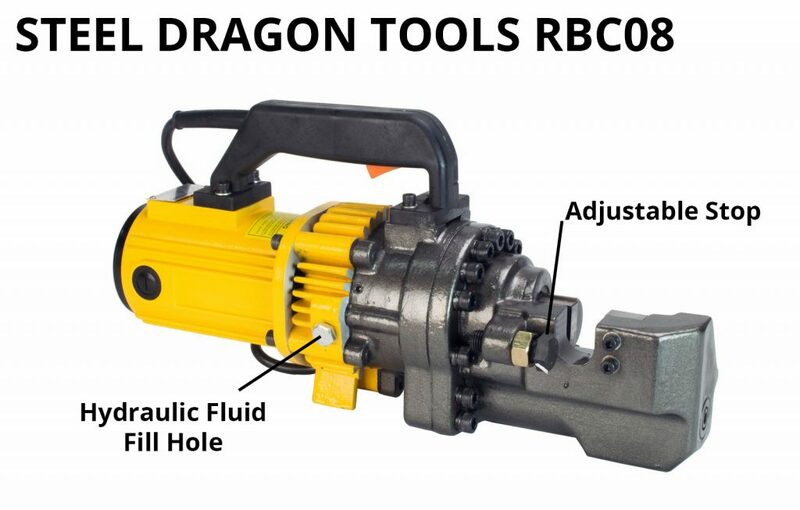 The Steel Dragon Tools version of the 87740 motor powers the Steel Dragon Tools 300 and 7090i. The 87740 motor is a versatile work horse and can be used across a variety of platforms thanks to interchangeable gearboxes. This motor is reliable, durable, and easy to service should the need ever arise. The 87740 motor has three main components; the field, the armature, and brushes. The brushes are the item most likely to wear out first. The brushes are designed to make constant contact with the commutator of the armature. 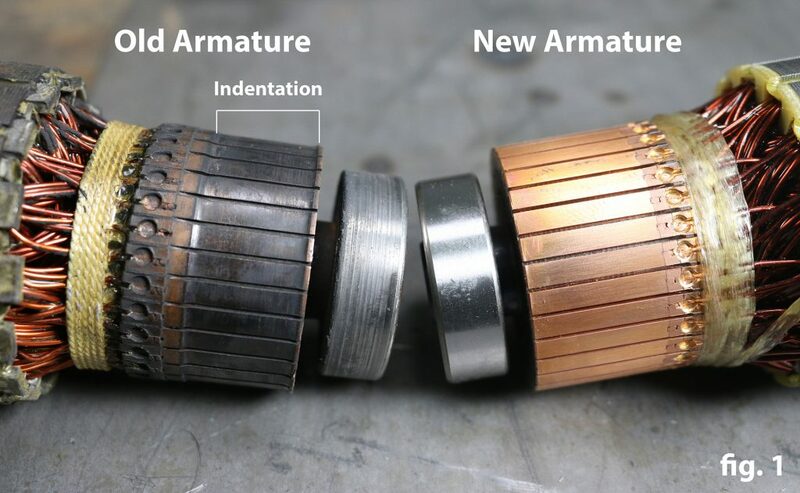 While the brushes are considered a wear item to be replaced on occasion, it is also important to inspect the armature and especially the commutator. After many years of use, the commutator can be worn away due to the constant contact with the motor brushes. This wear will result in a slight indentation in the commutator (fig. 1). New brushes will not be able to make solid, constant contact with the commutator, resulting in sparking, higher current draw, and loss of power. If the commutator shows this type of wear, it is easier and more cost effective to replace the entire armature. The motor field is not a wear piece and will rarely need to be replaced unless it is damaged. Damage is most likely to occur during operation or maintenance. The field can be damaged by an electrical surge or if an internal wire is pinched. Steel Dragon Tools offers replacement parts that will fit any 87740 model. 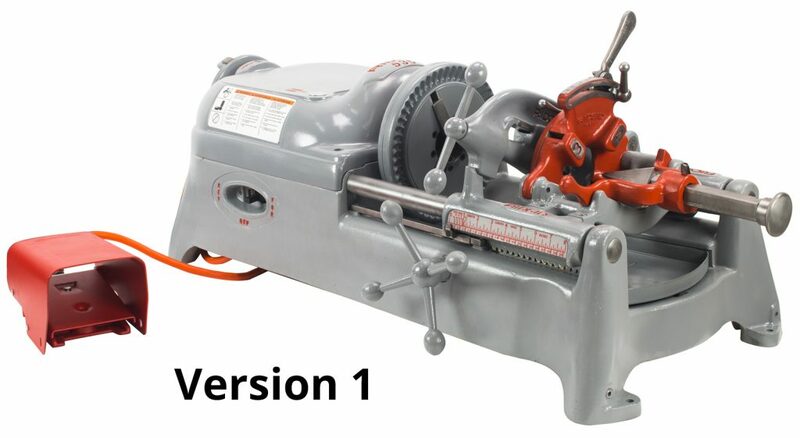 Steel Dragon Tools is also a full-service repair shop specializing in reconditioning pipe threading machines. Steel Dragon Tools technicians have decades of experience and can quickly diagnose and repair most 87740 motors. 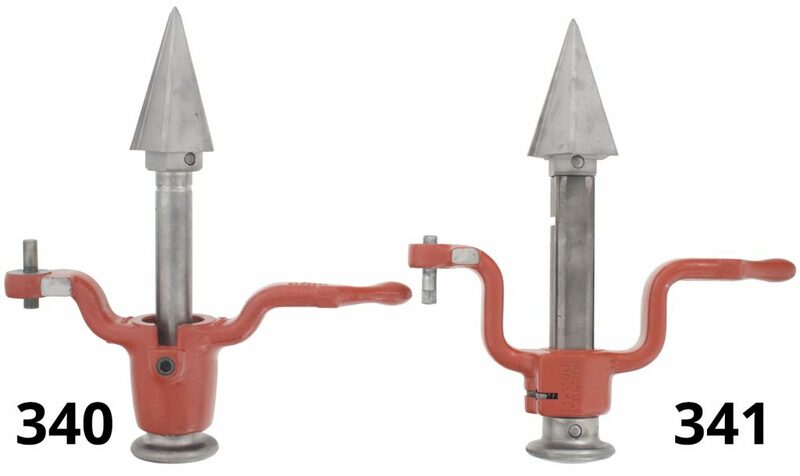 Steel Dragon Tools offers several different models of wire strippers. The two entry level options are the WRA10 and the WRA15. Both models can be operated manually with a hand crank or automatically with a drill. The WRA10 and WRA15 are an ideal entry point for anyone looking to strip wire and increase recycling payouts on scrap metal. The WRA10 is small, at 6-inches in height it is almost pocket size. 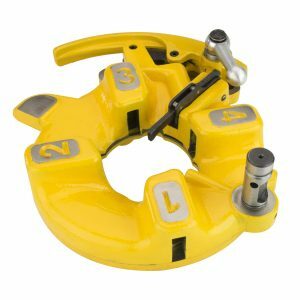 But behind the diminutive size is an easy to operate machine that will quickly and cleanly strip up to 450 inches of wire per minute when connected to a drill. The WRA10 will strip wire up to roughly 1/2-inch in diameter. The WRA15 is the more traditional benchtop model. It boasts a larger size and wire-stripping capability. 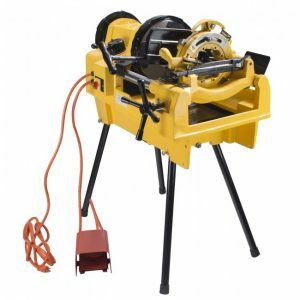 Standing at 12-1/2-inches in height it will also strip up to 450 inches of wire per minute when connected to a drill. The WRA15 will strip wire up to roughly 1-inch in diameter. Set up is the most important step to successfully strip wire. Following these tips will help make the wire stripping process quick and easy. These tips apply to both the WRA10 and WRA15. Secure the wire stripper to the benchtop. Screwing or bolting the wire stripper to the bench will stop it from moving during the stripping process, freeing the hands to feed the wire and operate the drill at the same time. Separate wire by size, set machine to strip that size, and then strip all of that wire at once. Getting the wire stripper keyed in to quickly strip the wire requires careful set up. Strip one size at a time before moving on to avoid wasting time readjusting between each piece. Do not run the drill at full speed. A common mistake is to run the drill as fast as possible. Typically, this will result in a wire that isn’t completely stripped as well as reducing the life of the cutting wheel. Run the drill slowly and at an even pace. The same applies when using the hand crank. Run the wire through twice. 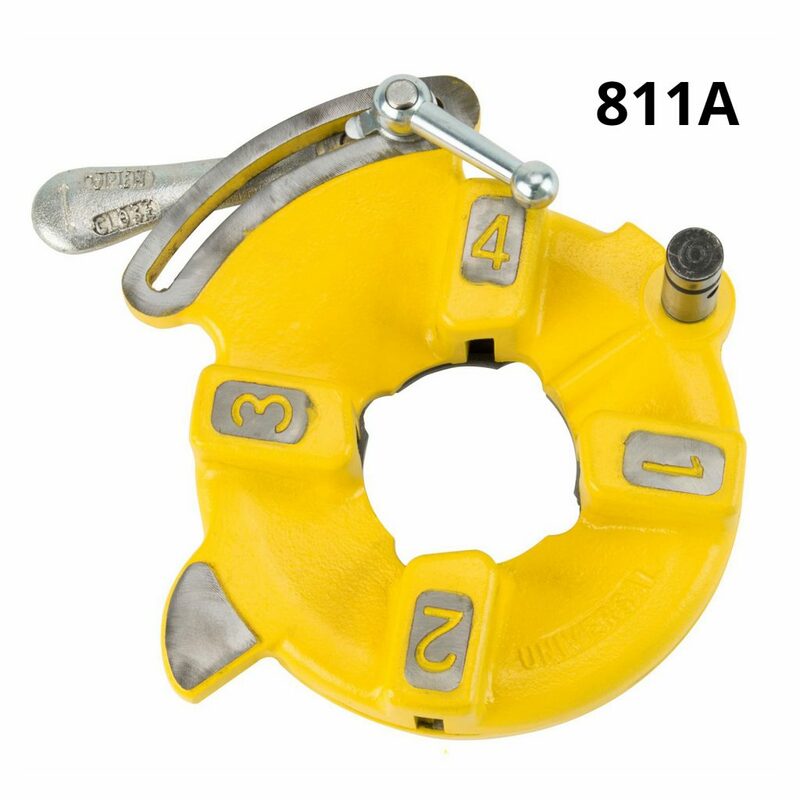 The WRA10 and WRA15 only have one cutting wheel. Run the wire through once and then rotate it 180 degrees before running it through again. Two cuts in the casing will make stripping the wire much easier. Straighten the wire and cut it into manageable pieces between 12-inches and 24-inches in length. A straight piece of wire has little chance of bunching up and clogging the machine. A short piece of wire will run through the machine quickly, especially if the operator wants to run it through twice. Running long pieces of wire can pose a safety hazard. This warning applies to the larger machines but the principle is still the same. When running long pieces of wire can be dangerous as the wire may become wrapped around the operator or other nearby objects. The operator or these objects can then be pulled toward the wire stripper if enough force is being generated. One of the common complaints from users of the Steel Dragon Tools Reconditioned RIDGID® 535 is that the chuck or the pipe wobbles, resulting in unusable threads. If the machine is not threading properly, check the dies first. A good set of dies should last a very long time. Unless the die teeth are chipped or otherwise damaged, the dies should work without issue. Next, check the installation. Dies will fit into the die head only one way but should be installed securely and in the proper order. If the dies are installed properly, check the rear centering chuck. The rear centering chuck simply keeps the pipe centered in the machine. Do not over tighten the rear chuck. Only hand tighten the rear chuck, do not use tools. The front chuck does most of the work when threading pipe. The front chuck should only be hand tightened. Do not use tools to tighten the front chucks. To tighten front and rear chuck, spin chuck forcefully in a counter clockwise motion. The chuck will tighten around the pipe. Do this several times to ensure a snug fit. The sound the that the chuck makes will change as it tightens. Once the sound changes, the chuck is tight. A tightened chuck will give off a short, dull sound as the chuck has already tightened around the pipe. The guide marks on the die head are not exact. Always run a simple threading test before threading the actual work piece. Use a properly-sized fitting to test the threads. A properly threaded pipe will allow the fitting to turn one and a half to two turns before meeting any resistance. If the fitting continues to turn easily or does not turn at all, the die head settings will need to be adjusted. Threads should only be cut to the width of the die head. Cutting threads too far down the pipe may result in unusable threads. Some dies are designed to cut tapered threads. Cutting beyond the width of the die head will result in straight threads instead of the desired tapered threads. When threading pipe with a Steel Dragon Tools die head, or any die head for that matter, it is important to remember that the scale on the top of the die head i s for reference only. The scale is used to get as close as possible to the correct threading size but it is up to the operator to test the die head, dies, and pipe. Start by setting the die head to the desired threading capacity. Thread a sample piece of pipe and test the pipe with a c orresponding fitting. A properly threaded piece of pipe will make one and a half to two full turns within the fitting before meeting resistance. A pipe that does not make one and a half to two full turns has threads that were cut too shallow. Shallow threads will not allow the pipe and the fitting to seal properly. A pipe that turns more than two full rotations in the fitting has threads that were cut too deep. A pipe with threads that are too deep may bottom out in the fitting, preventing the pipe and fitting from being tightened. Pipe threading is not an exact science, it will take a little finesse and patience to successfully thread pipe and it is a good idea to test the threaded pipe on a regular basis. It is also important to remember that in most cases a sealant will be used on the pipe and fitting to prevent leaks. Using a sealant will allow the operator a bit of leeway when threading pipe. The pipes themselves can also cause problems during threading. Pipes may not be true to their stated measurements. For example, a 1-inch pipe may be slightly smaller at 15/16 inches in diameter or slightly larger at 1-1/16 inches in diameter. The pipe may also be metric. A 25-millimeter pipe is slightly smaller than a 1-inch pipe but can look identical to the naked eye. Pipe variance must also be considered. Defects in the pipe from the manufacturing process can result in the pipe not being uniform from one end to the other. A pipe might measure 1 in. at the end, bow out to 1-1/16 in. at the middle before returning to 1 in. at the other end. It is always a good idea to periodically test the threaded pipe with a fitting to ensure a tight seal. 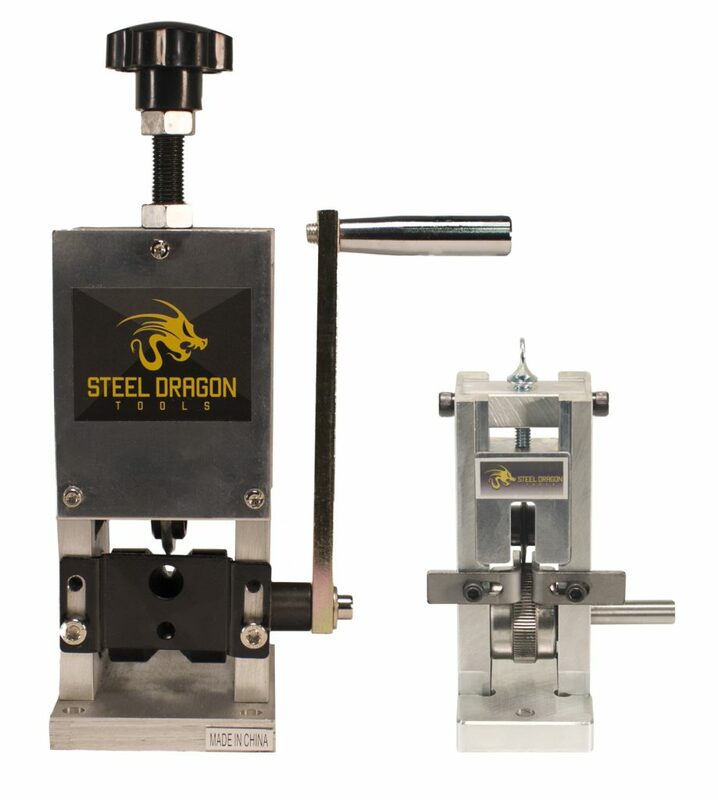 More information on Steel Dragon Tools die heads and dies can be found by following the links or calling customer service at 734-224-7112. Steel Dragon Tools die heads and dies are available for purchase from Craig’s Affordable Tools or Toolz Unlimited.